The Fellowship of Fly Fishermen. I wonder if you have ever lost your wallet? In this modern rushed age, what with myriad distractions numerous pressures and a world inhabited by nefarious characters the odds are pretty good that you have. Of course there is a world of hurt coming if this should occur, what with credit cards to be stopped and replaced, money gone and who knows what else suddenly plucked from your previously happy little existence. On the other hand there is equally, or at least I like to imagine so, cause for hope. You see I am forgetful by nature, easily distracted and prone to losing or forgetting things and wallets are only one of the many bits and bobs that have had to be replaced over the years. So you might say that I am something of an expert in terms of the joys and heartaches of potential loss. The bad thing is that should your missing wallet not turn up then everyone in the world is a suspect, your faith in the goodness of human nature is lost and you start to cross the road when others approach, lock your car at stop streets and huddle away from the now apparently threatening masses. Equally should some kind soul track you down and return the aforementioned item faith is restored, the sun seems warmer, the rain less bothersome, the flowers brighter and you find yourself tipping the guy at the garage who cleaned your windows for you. In my rather skewed outlook of the world and the people in it I like to imagine that fly fishermen would return the wallet more often than not, it just seems to me that most of us are above such things as common theft and perhaps actually bordering on that near antisocial trait of honest helpfulness. I am not sure which comes first the chicken or the egg, the outlook or the fly rod? I am however writing this with a warm heart and yes I did tip the guy at the garage who cleaned my windows. You see my faith is restored and if not in the unwashed masses of this global village at least in with regards to the washed or unwashed members who wield fly rods. I have recently returned from an extended stay in the UK, the land of my birth, and although the primary motivation for the trip was a family wedding the hidden agenda was undoubtedly to secure some fishing, hopefully a lot of fishing. I was rather keen to slot in a bit of boat fishing on larger lakes, something not overly available in respect of my local geography and at the same time was trusting that I may even organise some stream fishing, maybe even chalk stream fishing for that matter but with little idea how to go about organising it. 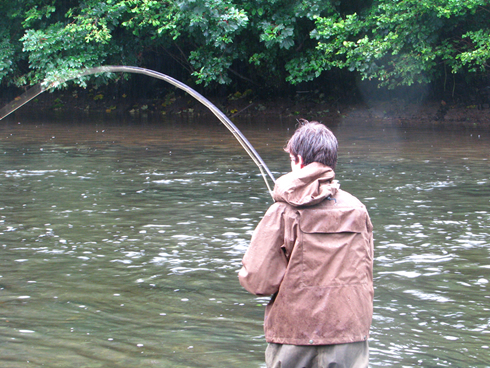 Stream or river fishing in the UK isn’t quite so easy to come by as one may imagine, in fact for a country which seems to see little but constant rain and with every piece of low lying land a potential trout, salmon or grayling haven it can prove uncommonly tricky to gain access to water. Much of it is privatised, inaccessible, overpriced or simply not spoken about so prior to my planned departure I did a bit of on line research. Whereas in the past possibly fly tying, casting or whatever were essential skills for the avid fly-rodder, perhaps for the modern piscatorial traveller it is equally essential that one can tickle the keyboard and at least make some progress with Google and Email. So it was that I managed to locate a few fellow anglers who proved uncommonly helpful and to whom I now find myself in considerable moral if not financial debt. 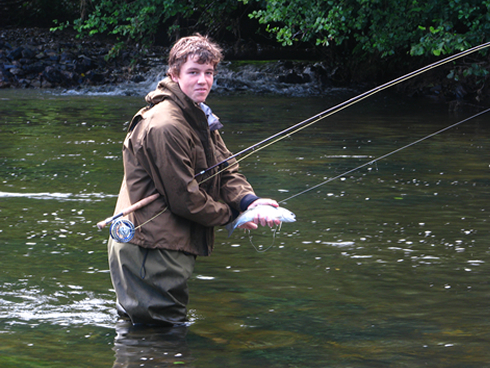 The first was Adrian Howell, the secretary for the Tiverton Fly Fishing Association. This very kind gentleman not only agreed to meet up with me but had already organised that I could fish the River Culm with his friend Darren Blackburn that same evening. Only a fellow fly fisher would assume that you were up for a fishing trip unplanned in less than three hours’ time and I saw it as a measure of the man that he would even consider this normal behaviour, because of course I would too. Darren proved to be a wonderful host and afforded me the privilege of a guest ticket on what proved to be a glorious small stream. It is technically a spate river but it flowed quite clear and looked to all intents and purposes the same as a small chalk stream or limestone creek. Long strands of Rununculus bearing the prettiest white flowers waved in the current and numerous fish sought food and shelter amongst the waving fronds. Unfortunately the evening rise only just got started before a downpour and a drop in the air temperature seemed to put them down but we both caught fish. Salmon Parr and Brown Trout, all as pretty as pictures, the Parr with blue finger marks on their backs and the brownies with gloriously vivid red spots and full tails. All this organised by two fellow anglers who had never previously met me and had absolutely no benefit from sharing their treasures, I was already feeling eternally grateful to them both. Bickleigh Bridge on the Exe, a perfect view with which to end a lovely day. The next day however Adrian had organised for me to fish on a section of the Exe, primarily a salmon river but containing both wild browns and grayling and thankfully left pretty much unfished. This state of affairs as I understand it primarily a result of the onerous health and safety regulations which have prevented the hotel on the banks from offering the fishing for fear of someone falling in and the potential costly legal battle that might ensue. 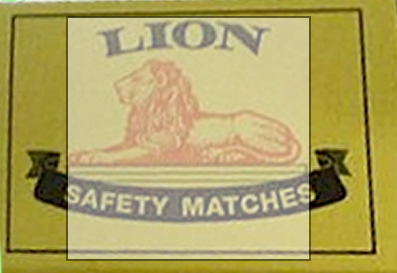 I suppose that perhaps they already knew that South Africans are not overly litigatious and that the fly angling subspecies are really rather up for something of a challenge. It proved to be a most interesting piece of water to fish, reminiscent of the Welsh Dee that I had fished in Commonwealth Championships and although I didn’t really have heavy enough flies for the water I was able to secure a few decent brown trout and again those pretty salmon parr. Perhaps the greatest joy was that I could fish techniques uncommon on the smaller rivers at home. Czech nymphing, mono-nymphing and swinging flies downstream all proved effective and I had a wonderful time. 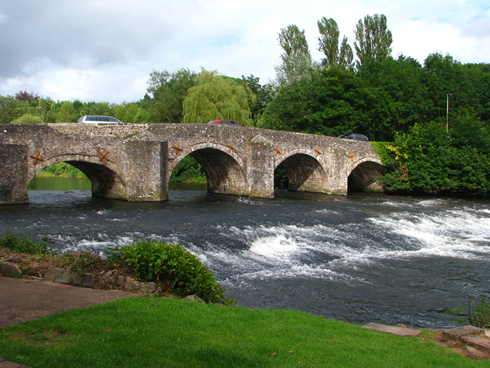 Not least because at the top of the beat lay the beer garden of the Fisherman’s Cot hotel which offered both cold real ale (Hobgoblin Ruby Ale if you must know) , a view of the river and the ancient bridge at Bickleigh with the constant hope of spotting a salmon moving over the weir. The salmon didn’t materialise but other than that it was a perfect end to the afternoon, even the sun shone just before it set. One would have to question if things could get better but perhaps Adrian had indeed left the best until last. On day three I was given the chance to fish with Adrian and his son Adam on a higher section of the Exe. Private water and somewhere that I would never have been able to access without this kindness. This section of the river was a tad narrower than the section of the previous day, again primarily a salmon beat but holding good numbers of both wild brown and escaped rainbow trout with even the promise of a grayling. I was most hopefully of catching one of these “ladies of the stream” if only because they are not available to me on home waters and they are so pretty. Adam Howell does battle with a feisty trout on the Exe. Initially I set about Czech nymphing in a deep and fast run and the technique proved too much temptation for the escaped rainbows. The fish had however acclimatised very well to their new home and fought like Trojans. Pretty soon however I gave up the rod to Adam to show him more of the technique and it became obvious that I wasn’t going to pry the Gray’s Missionary from his hands once he met with success. The rain came and went and amidst something of a downpour we all shared a cup of tea courtesy of that spectacularly clever invention the Kelly Kettle which managed to produce a warm brew fed only with a few damp twigs. Adam continued to fish with the Czech nymph rig , Adrian set about swinging some traditional wet flies downstream and I elected to upstream nymph with a pheasant tail and a dry sedge. It is remarkable that we all caught fish on these different methods, although I think that still perhaps Adam, having honed his technique, had the best of it and was enjoying fishing down behind his dad and pointing out just how many fish Adrian had failed to lure up with those wets. Once confident with the technique Adam was leading the way with his catch rate. I managed to hold my own with the upstreaming and was most pleased to capture at least one pretty and not insubstantial grayling such that by day’s end we had all enjoyed both success and a good deal of fun. I was even invited to supper and I have to confess felt truly blessed that a family who had never known of my existence would put themselves out to such a degree to make my holiday most memorable. In my next post I shall continue the theme because I was equally well hosted on a genuine English Chalk Steam, but more of that later. For now I just want to say thank you to Adrian and his family for making a real mark on my holiday and to Darren for allowing me to interfere with his quiet evening contemplations on the Culm. You have all not only afforded me opportunities and pleasures which, without your help, I would never have experienced but equally you have restored my faith, both in people in general and in fly anglers in particular. I had a whale of a time and I do trust that I might one day be able to return the favour. It is times like this that I truly do believe that there is a fellowship amongst fly fishermen, a selfless bond which will glue us together over time and make all of us better people for the experience. Sometimes people ask me why I fish and it is people like Adrian, Adam and Darren who provide me with the power to just smile knowingly at the question and feel pity for the asker. By the time you read this I should have one of these in my hands, at least I hope so. 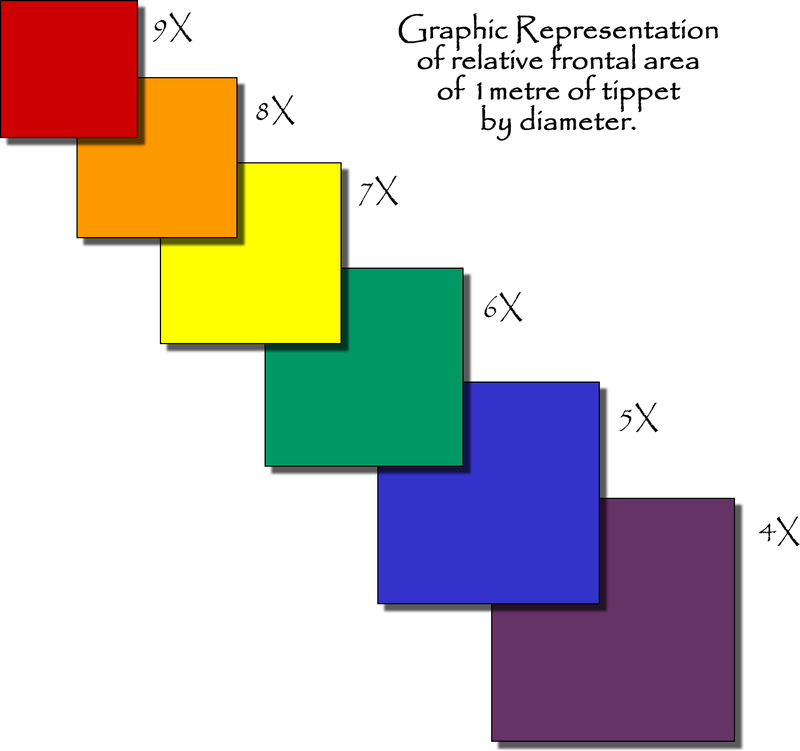 Due to the wonders of modern technology, and for me anything more advanced than a slide rule is pretty wonderous I have to admit, I can post this when I am nowhere near a computer. In fact I am nowhere near anything much, or at least that is the plan. By now we should be happily camped on the edge of the Orange River on the Namibian border with nothing to do but cast for yellowfish and perhaps tie the odd fly if the situation dictates. Preparations have been hectic, one minute we were chatting about a possible trip and the next thing we were going. It didn’t help that I found that I had the dates incorrect and had a day less than expected to prepare, but then as with all these types of things, eventually one realises that if you have forgotten something you will have to do without it and that is all that can be said. The only real worry is that Mike, Albe and myself are all avid anglers which means we will no doubt have a plethora of rods, reels, lines and flies. Probably some alcohol and a few items of clothing and if we are really fortunate one of us is going to remember to bring some food. Years back I did spend three days on the Vaal with little more than three bottles of beer some bread rolls and a packet of chips, but the fishing was good and I lost some weight, it is amazing what one will do to catch a few fish if you have the fishing gene. Big Water, Big Sky, Big Desert and great fishing. 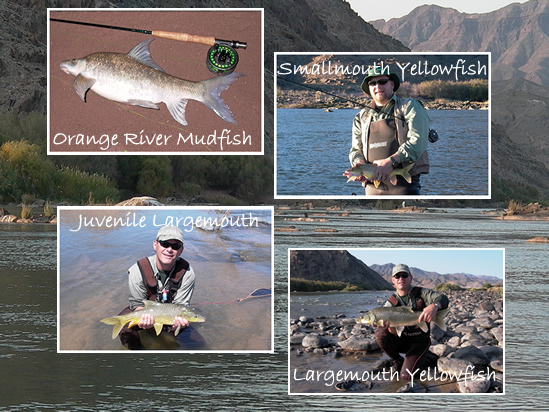 For those not familiar with yellowfish they are the unsung heros of fly fishermen in Southern Africa. Living in Cape Town we don’t have any really good quality yellowfish water near by and a trip out into the sticks is something of a winter ritual. 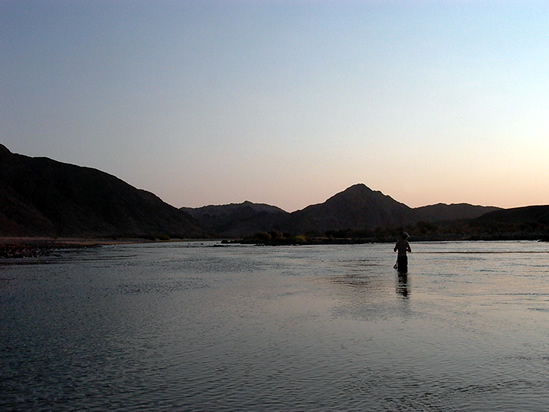 It helps that the waters of the Orange River (it isn’t called the Orange because of its colour, although often it could be), run clear and low at exactly the same time that the Cape Streams are unfishable. There are a number of species of yellowfish and related species which are technically not yellows but tend to be referred to under the same umbrella. An interesting evolutionary divergence is that each is pretty much tied to specific riverine systems. The Smallmouth and Largemouths (our two targets on this trip), live in the Vaal / Orange River system, the Clanwilliam Yellowfish and the Sawfins are found in the Oliphant’s system, closer to home but hard to access. The Natal Scaly is found in the Eastern part of the country in Natal and the Smallscale and Largescales are found in the Limpopo systems and the occasional Witvis in the Breede River Catchment. The trouble with all of that is that it makes conservation a problem, one can’t simply transplant fish from one watershed to another and whilst some of the species are not under threat the Clanwilliam and Sawfins are. For those not in the know yellowfish were thought to be virtually uncatchable on fly for many years and those that were caught seemed to be some sort of lucky aberration. However advances in techniques of both fishing and fly tying saw the catch rates climb rapidly, particularly with spread of understanding of the Czech nymph style of fishing. Yellowfish are for the most part bottom feeders, focusing on larvae and pupae of aquatic insects hard on the bottom and frequently in very fast water. (The Largemouths as juveniles feed in much the same way but then become piscivorous once they gain size, and they can gain some serious dimensions). We will probably practise a variety of techniques, some because they are effective and others perhaps simply because they can be more fun. But the standard is to fish heavily weighted Czech nymph patterns on either a normal Czech nymph rig or even fishing with pure mono and no casting of any real sort. The trick is to have the patterns running hard on the bottom in white water conditions on occasion and to still be able to detect what can frequently be very subtle takes. For those familiar with grayling fishing this is much the same except that the fish are far bigger, far stronger and the current and size of the rivers more vicious than most. Some Scandinavian rivers probably are of similar dimension and flow but few English rivers would be as large. If one finds the fish and you are proficient at the methods you can literally “hammer ’em” and frequently after a while we will change to upstream indicator nymphing in the slightly slower and shallower waters, if only for some variety. After years of competative angling where indicators other than flies are out of bounds it is going to be fun to experiment with variations and I have a few tricks up my sleeve worthy of testing out. Then of course there is the chance if the water is clear that there could be some dry fly action, down on the lower reaches this isn’t common but it can occur and casting small dries for fish well above the average size of most trout makes for some exciting sport. Plus we really should spend some time with streamers trying to nail some Largemouths, we have caught a good number on the lower reaches but usually as a byproduct of fishing for the smallmouths. It is amazing how large some of the fish are that will still take a tiny nymph, but to seek out really massive specimens we should focus a bit with some hard-core streamer fishing. This time we might even get around to it. So if we don’t get lost, starve, drown or meet some equally dreadful fait such as poor fishing, there should be some more photos when we get back. Until then I am thankfully out of touch with the modern world.